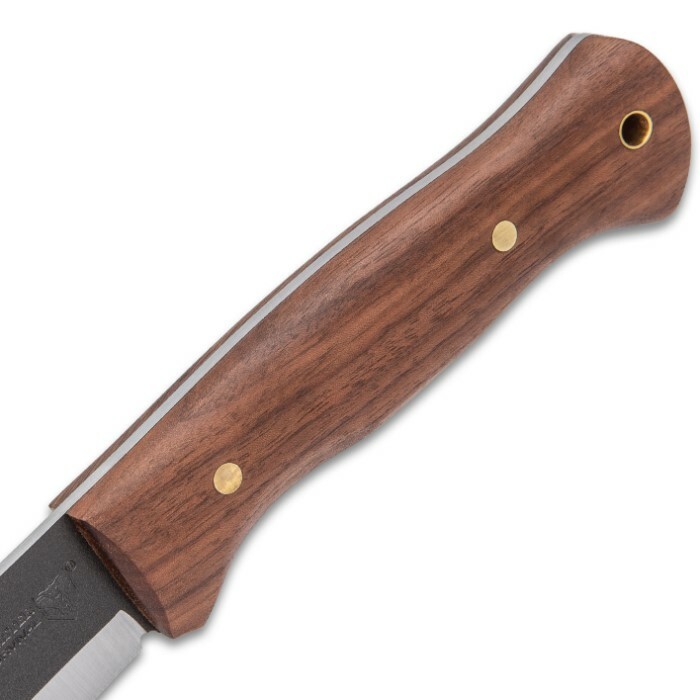 Hardness and durability are the hallmarks of the richly veined zebra wood used to craft the handle scales of the Bushmaster Bushcraft Explorer Fixed Blade Knife. The scales are securely fastened to the tang with brass pins, assuring that when you use this awesome camping knife, you will never have to worry about its reliability. 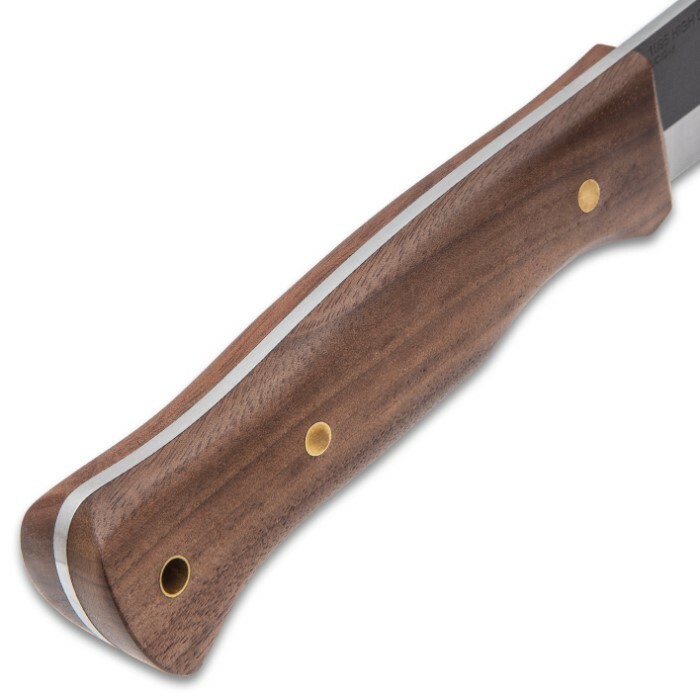 Combine the incredibly strong zebra wood with a 4 3/8” 1095 high carbon steel blade that’s razor sharp and you have a knife you will use for every situation. 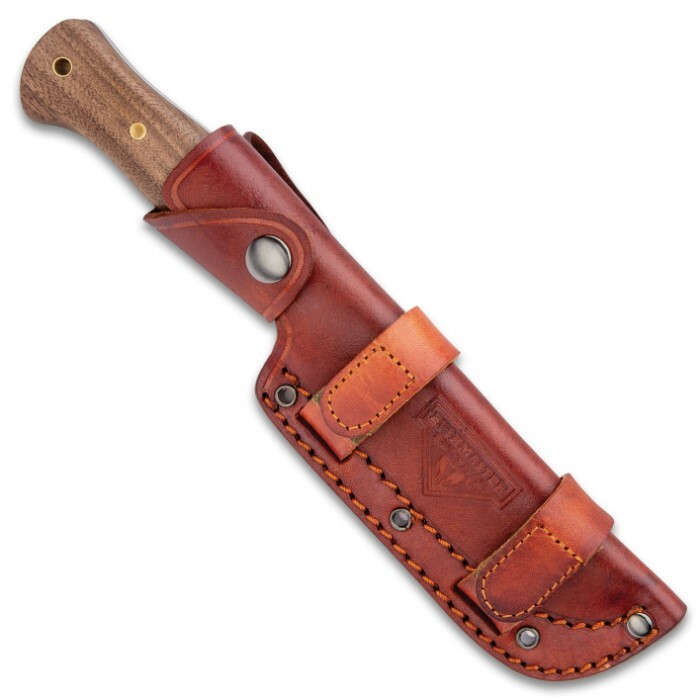 The fixed blade is protected by a genuine leather belt sheath with a snap closure and lacing holes. Also, a lanyard hole in the knife’s handle offers an alternative carrying option. Just received mine today!! VERY Impressed! Its a Workhorse of a Blade and the Sheath is REAL Leather! Cant beat the Quality of this knife for the Price!! Very Good Purchase!! I am by no means an expert, but I ordered this knife for the sheath, and I am glad I did. The knife itself is of high quality... Durable and ergonomic!!! And the sheath is honestly of great quality!!! I fully intend to order several of these as gifts for my brothers and my best friends. You wont be disappointed, especially at this price. One of the best field knives I've ever used! I have hunted, fished, served 20 yrs in Special Forces and other than my K-bar this is the best. The sheath is worth the price by itself. You can't go wrong with this one! 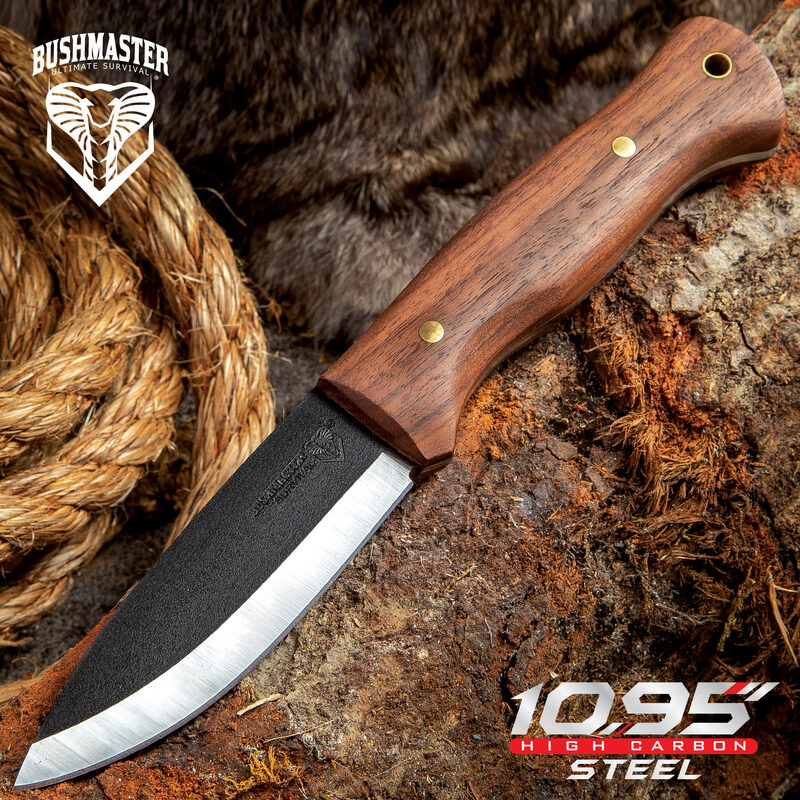 It's a heavy duty, carbon steel blade with strength that you can trust. The sheath is excellent. It is carbon steel so always wipe it down with a light coat of oil (cheap cooking oil is fine). I own many knives from various parts of the world both high end and low end price wise. The only type I purchase must be fully functional working blades. This may well be the best blade I own for its in tended purpose and, for that reason, I just placed another order for two more before someone decides to raise the price. I listen to folks say they would never buy a Chinese knife. I'm old enough to remember when the Chinese first broke into the American market and bought some of their knives. They were of lesser quality back then; and there may still be some today; but this is not (repeat-NOT) one of them. And the many other blades I own from China are also good. You just have to be very selective. So, what about this knife. Seems like the other reviewers have said it all. This is a superb piece of workmanship both the knife and the sheath. Like I said, I just ordered two more; so you better jump on the bandwagon before they are no longer available. This knife is outstanding. I own many many high dollar knives and this $30 sands right next to them if not taller. The 1095 steel blade performs flawlessly at all I throw at it. Holda it's edge very well. Nice thick blade and the tip is made extra nice for stabbing tough things. The case is worth the price of this whole package by itself Top quality thick leather worn verricle or horizontal. The Zebra wood handle is nice, big, and unfinished. A little slippery until a few coats of polyurethane was applied. It protects the wood and not as slippery in hand. Going to buy a couple note as gifts. This is one complete package you don't want to pass up. Hats off to Bushmaster for giving us all the opportunity to own such a fine product at such an affordable price !!!!!! I have many knives.... some expensive, others not so much. This knife is the best value of any knife I own. I have beat this knife to death and can't seem to hurt it. The durability plus the sheath... make it ridiculously low priced. I'm gonna order another couple. Its a no brainer. ???? This is a very good knife both in functionality, and looks. It came shaving sharp right out of the box. It is very comfortable in hand, and the fit and finish is very good too. It's a good knife even if it was twice the price! 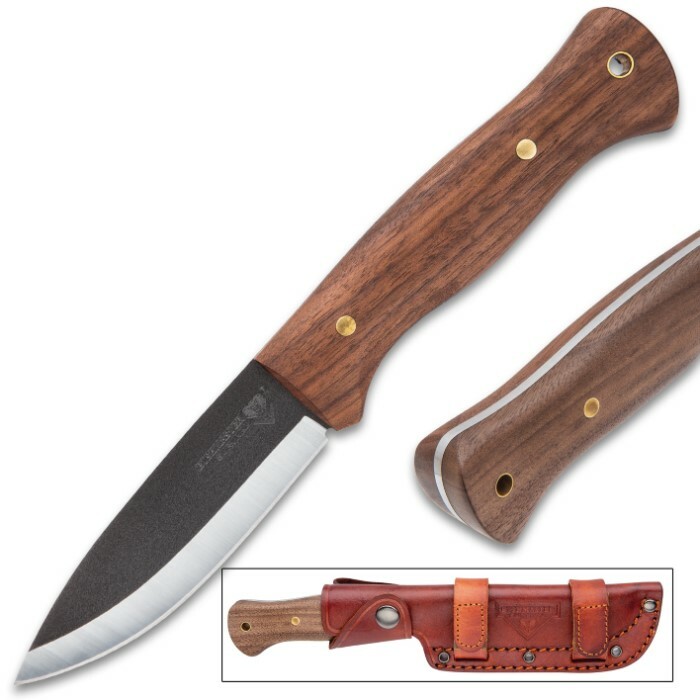 I would put this knife up against any normal production bushcraft style knife under $100. The sheath alone is worth the price Most knives nowadays seem to come with either cheap nylon sheaths, or shoddy made low quality leather, but not this one. The sheath is awesome. The knife snaps in almost like it was kydex, the leather is of pretty decent quality as well, and it is constructed good. The stitching is even, and it feels quite sturdy. I would easily pay $30 for the sheath alone. I own many knives of all price ranges, and I would match this one against any of my other more expensive 1095 steel knives of this size, style, and intended use designs. It's refreshing to see a well built product, made with quality materials, at a price anyone can afford. Good job Bushmaster, and good job BUDK! A hell of a great knife. Beautiful, sharp working knife with a fantastic sheath. Sharp enough to shave, right out of the box. Might buy another to keep as a spare.